"Babak Pasdar is a computer security expert who was hired in 2003 to help restructure the tech infrastructure at a major wireless telecommunications company. What he found shocked him. "The company had set up a system that gave a third party, presumably a governmental entity, access to every communication coming through that company’s infrastructure. This means every email, internet use, document transmission, video, text message, as well as the ability to listen to and record any phone call." Obama Critic Quits Radio Show Over Hatred? Those types of comments seemed to set listeners off and resulted in hate mail. by D. Cupples | If President Nixon's staffers had access to our technology, they wouldn't have sent five guys to break into and tap the phones in the Democratic Party's offices at the Watergate complex. And we likely wouldn't have learned of the Nixon Administration's violations of law and abuses of power. Perhaps Sen. Obama should have been a tad more flattering toward the people whose state primary is less than two weeks away. Given the Reverend Wright flare up last month, perhaps it would be prudent for Obama to refrain from saying things like "religion" and "antipathy to people who aren't like them" in the same sentence. by D. Cupples | It was scheduled for 8 am on Friday, when most people had to work. The people at an online forum of Hillary Clinton supporters had very little time to organize it, and they didn't have a promotional budget -- no radio, TV, or newspaper ads. They largely relied on blogs, emails, and word of mouth. The result: a diverse crowd of about 150 people gathered near Rockefeller Plaza, armed with signs and petitions, to peacefully protest voter suppression and the pro-Obama (or anti-Hillary) media bias that seems to have become commonplace during this presidential primary season. The protesters managed to get nearly 200 passersby to sign petitions. "Pennsylvania for Hillary today announced over 270 local elected officials from across the Keystone State endorsed Hillary for President. "These local level endorsements include leaders such as members of congress, city council members, county commissioners, state representatives, and state committee members, and demonstrate Hillary’s momentum and support in the Keystone State." "The U.S. Military said it fired two Hellfire missiles just before 10 a.m. [yesterday] after spotting fighters in Sadr City with at least five rockets. Officials said another missile was fired a few minutes later at a black sedan near a rocket launch site. "Ten people were killed and 22 wounded in Sadr City on Thursday and late Wednesday night, according to the Sadr office in the area, which did not specify how many people were killed in the airstrikes." Posted by Damozel | Did anyone ever doubt that certain top administration officials were involved every step of the way in authorizing the interrogation techniques used on al-Qaeda? Most of the people I know certainly thought so. Everyone, in fact, except my mom. So I am not surprised, though somehow I am quite shocked. There is quite a bit of difference between 'knowing' and knowing. And now the 'highly placed sources' have come out of the woodwork. What took you so long, highly placed sources? Indiana School Allowed Obama but Not Hillary to Speak? "School officials say Clinton’s visit would have interfered with the school day. They also worried that the visit would give the impression the district was endorsing Clinton." When Sen. Barack Obama spoke at that same school on Wednesday night, he was introduced and endorsed by Congressman Tim Roemer and South Bend Mayor Steve Luecke. This likely confused 3,500 South Bend residents about the school district's neutrality. If all else fails, the Democratic Party could simply fold its arms and blink its eyes and wish for party unity. 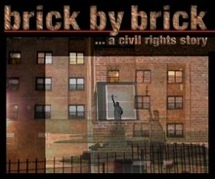 D. Cupples | In celebration of the 40th Anniversary of the Fair Housing Act, documentary film -- Brick by Brick: A Civil Rights Story -- will close the US Housing and Urban Development Policy Conference in Atlanta on April 11, 2008. "I hoped a film could explore how and why communities evade federal laws designed to end housing discrimination. For years, the city of Yonkers, New York had done this— and by studying its history, I thought a film could illustrate the political mechanics of housing discrimination and the often-related educational segregation that follows it." If you can't make the Atlanta screening, you can order the DVD here and see the screenings schedule here. posted by Chris | The first quarter of 2008 has mercifully come to a close with the S&P 500 posting a 10% loss. Much to our chagrin we have experienced back-to-back negative quarters with the 4th quarter of 2007 losing approximately 5%. Indeed the bull market that we enjoyed didn’t end with the classic large cap stock run up and along with profound investor glee, but rather with multiple shocks coming from the catastrophe that is the credit markets. Elton John on the Hillary-Baiters: "I Say to Hell with Them"
Posted by Damozel | I wish I could have been there. Inside, Bill Clinton introduced his wife, thanked the packed house for contributions to keep the race going, and asked for more, to shouts of "We miss you, Bill." "If you know anybody who didn’t come here tonight who could send some money over the Internet …," he said. Posted by Damozel | Back in the Eighties, I was an overwrought, culture-bitten little geek who not only read Camille Paglia's Sexual Personae cover to cover in one day, but carried it with me everywhere I went for months afterward. I can't remember what eventually replaced it, but something else must have. Something always does when you're that age. by D. Cupples | I know. It wasn't the point of yesterday's Senate hearings, but I still want to know how those 190,000 U.S. weapons (nearly 30% of the weapons we provided to Iraq). Let's hope they didn't end up in enemy hands. We first learned about the lost weapons in August. General David Petraeus, who was in charge of arming and training Iraqis in 2005-05 (when the weapons disappeared) chalked it up to clerical errors. Anyway, Gen. Petraeus reported yesterday to the Senate on progress in Iraq. Similar to his September report, he said that progress is "fragile and reversible." In other words, the Bush Administration hasn't wasted lives or tax dollars on this war, but we still need more of both. by D. Cupples | As well as troop-withdrawal, Sen. Hillary Clinton discusses in the video clip below a crucial issue relating to stability in Iraq: allocation of the Iraqis' oil (about 4 minutes into it). In a bipartisan effort with Sen. John Ensign (R-NV), Hillary has tried since 2003 to persuade the Bush Administration support an oil trust. The banter between Hillary and host Joe Scarborough is reason enough to watch the video clip. by D. Cupples | Apparently, it's media-bias day at BN-Politics. 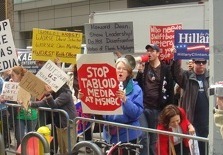 Some media outlets don't even try to hide the fact that they've unofficially joined the Obama campaign. Some are more subtle: instead of worshiping Obama or trashing Hillary, they merely present or omit "facts" in a way that gives a vague impression. Case in point: last night, a segment on ABC News discussed which presidential candidate some soldiers in Iraq are supporting. The segment started with a soldier who supports Barack Obama then showed a few brief comments from other soldiers: as I recall, more than one support Obama, and more than one support Hillary. This morning, ABC's Internet version of the story gives a different impression. Posted by Damozel | So you think Hillary supporters are just whining when we complain about the way the media twist and distort the facts reality-show style to cast her at every turn as the villain? Let's consider the latest media allegations against her: that Hillary misrepresented the facts concerning the death of a young pregnant woman from Ohio whom Hillary alleged had died as a result of being unable to pay for necessary medical care. .In fact, Clinton was relaying the facts correctly; she just hadn't been told all the details. And in fact, the details didn't really matter to the point she was trying to make. There is some satisfaction, though not nearly eniugh, in seeing that the journalist who helped set the story in motion forced to set the record straight. "Land Commissioner Mark Wilcox, who was selected last month as the Arkansas Democratic Party's last remaining superdelegate to the national convention, said Monday he's supporting the New York senator." It seems that every time a super-delegate comes out for Obama, the media celebrates with great fanfare. It'll be interesting to see what sort of media coverage Mr. Wilcox's decision gets.